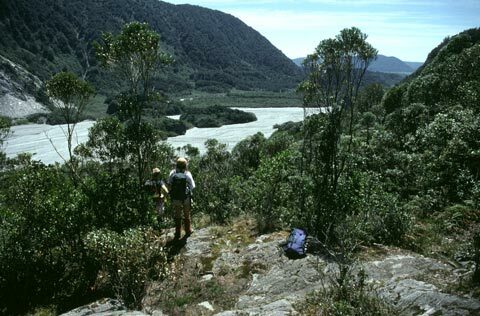 This is the Waihola Valley, downstream from Franz Josef Glacier in Westland Tai Poutini National Park. Kāmahi–southern rātā forest grows on rocky surfaces that were formerly covered by the glacier. The oldest trees (foreground) established around 1875. The forest on the rocky features on the valley floor started growing after 1867 – at that time, the toe of the glacier lay over the rocks.